I am very sure you are conversant with the word 'sibling'. In fact, you can even tutor me on how to use it. Lol! However, I doubt if you have any cordial relationship with the word 'nibling'. 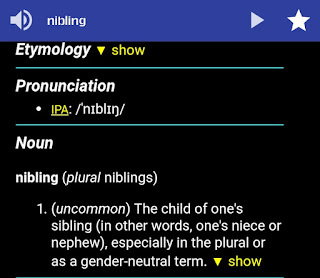 Unlike sibling, nibling is very rare in terms of usage, perhaps as a result of its absence in most English dictionaries. But that can't stop us from knowing its meaning and usage. It is also very important to state that 'nibling' is different from 'nibbling' (which is present in all English dictionaries). For this article, the former is our concern. 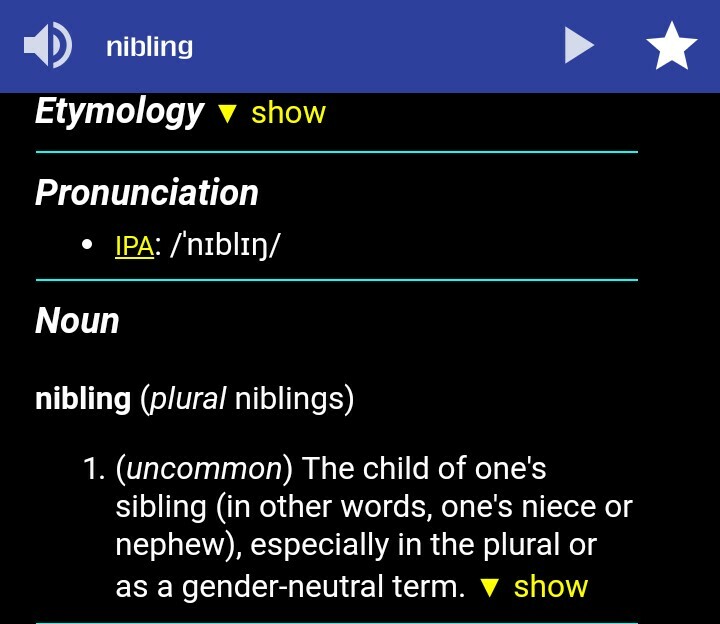 Just like cousin (that is, the son or daughter of your uncle or aunt), nibling is a gender-neutral term. It is a name for either your niece or nephew just as sibling is a name for either your sister or brother. English is very interesting sha! I hope very soon we won't have 'couslings'? Lol! The new word for the week! Wow! Thanks for this new word learned today. My niblings, smiles. Enter your comment...thanks for this.